The Lemo 2 has a classically sleek stainless steel appearance along with 510 threading, complementing almost any battery it's paired with. But don't be fooled, the Lemo 2 isn't all bronze and no brains, it has some advanced and very useful features to us Vapers. It can hold approximately 3.8 milliliters of e-liquid, but how you are able to fill it with liquid is a more important and unique aspect. With its new design you are able to fill your Lemo 2, without detaching any components, through a side e juice fill hole. When filling your liquid through the side hole make sure to close the air control valve completely or else liquid will seep out. To take full advantage of your side fill feature simply rotate the top metal cap towards the right opening up the gap. 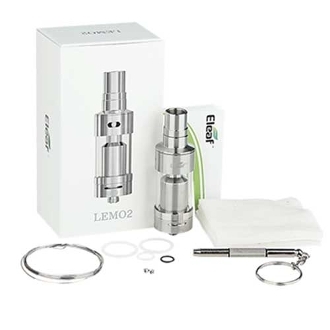 (We recommend using a drip tip bottle or an e liquid bottle with a drip tip on it, for an easier fill) The Lemo 2 contains a peek insulator which is known for its high heat and corrosion resistant material build. The Lemo 2 is an RTA atomizer, which means it comes apart in many pieces. These pieces include 1 stainless steel mouth piece that simply pulls out from the top cap. An air flow control piece that unscrews from your bottom cap. The top cap, when unscrewed may have your chimney still attached. Your glass piece and finally your deck with the RBA section. This will allow for easy cleaning and maintenance, giving you a crisp direct flavor with each vape The Lemo 2 also comes with a pre-built .5 ohm coil with cotton already installed to start your vaping experience with this beautiful hi tech RTA atomizer.